It's important to know how we've classified the clocks in this guide to effectively use the Search by Type option. That way, even if you don't know the maker's name, you can still find clocks similar to yours without looking through more than 21,000 clocks! We also don't want you to miss seeing the clocks in this guide whose maker is unknown. The 44 categories we've chosen for clock types are rather broad and somewhat arbitrary. Different books and clock experts may call the same type of clock by different names according to geographical differences and trade custom, sometimes causing confusion. What may sometimes be called a "bracket clock" in England may simply be called a "shelf clock" or "mantel clock" by a US dealer. What some people call a "grandfather" clock may be referred to by others as a "tallcase" or "longcase" clock. Main categories of clock types can also be further broken down into subcategories. To simplify searching we haven't done so here. For instance, within the broad category of "beehive" clocks there may also be found subcategories such as a "gothic" beehive or a "ripple" beehive. 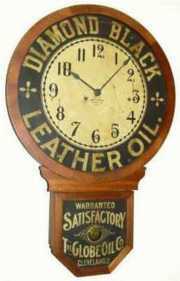 Some may the subdivide the broad category of "drop trunk" clocks into finer distinctions, such as "schoolhouse" clocks, "Act of Parliament" clocks, "wall regulators", "tavern" clocks, "short drop", "octagon drop", and so forth. You can see the main classifications we've used by looking through this section. It will make it easier to find what you're looking for when you use the Index or our different search options. You can use the pulldown menu below to jump to the category that interests you. Collective term for clocks used for promotional purposes that display advertisings somewhere on the clock dial or case. The clock might also be used as part of the advertising, as when a clock is incorporated into a larger sign. Most commonly found as wall clocks or shelf clocks; more rarely as longcase or 'grandfather' clocks.